Same product as the popular Victor Tin Cat Mouse Trap, for less! The Catchmaster Mouse Trap 612MC is a live-catch trap that is easy to use, catches up to 30 mice at a time, and requires no setting. Simply place the trap along a wall where mice like to travel and it is ready to go. Inquisitive mice will enter the trap, triggering a lever that will trap them in a holding area inside. They can get in, but there is no way out until you release them. Dimensions: 10.25 in x 6.25 in x 1.75 in. Note: The glue board in the trap shown in the picture is sold separately. If you would like to put glue boards in your catchmaster trap, we recommend that you purchase Trapper LTD Glueboards. The lid has a clear top so you can see the mice when they are caught. Place trap near baseboards, corners, along walls, or in spaces where mice are likely to travel. 10.25 in x 6.25 in x 1.75 in. Same product as the popular Victor Tin Cat Mouse Trap, for less! 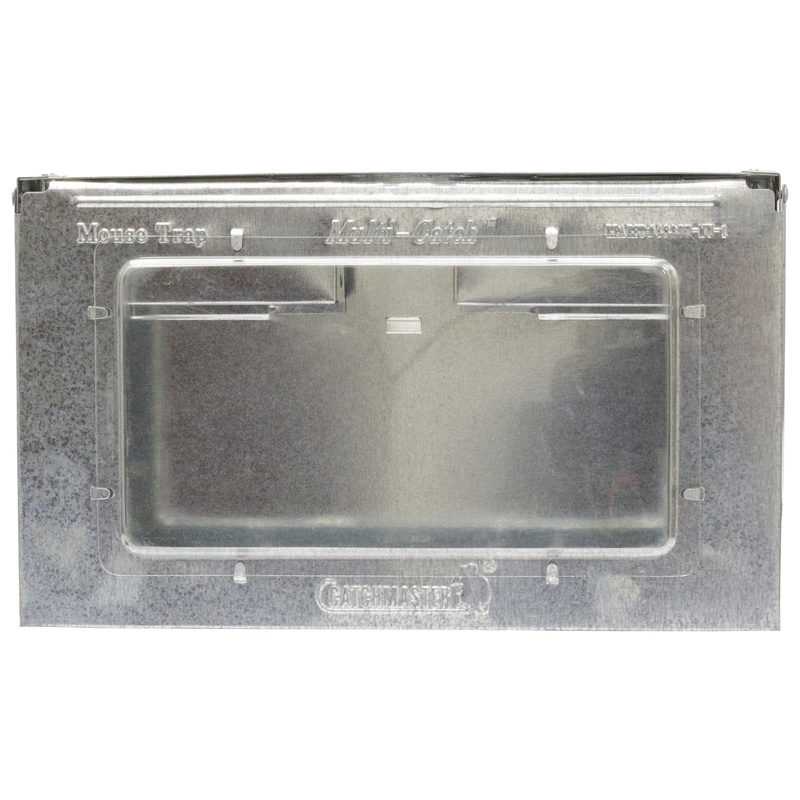 Catchmaster Multi-Catch Mouse traps (MODEL 612MC) have a very low profile (only 1.75 inches tall) allowing them to be placed in tight areas or under pallets. 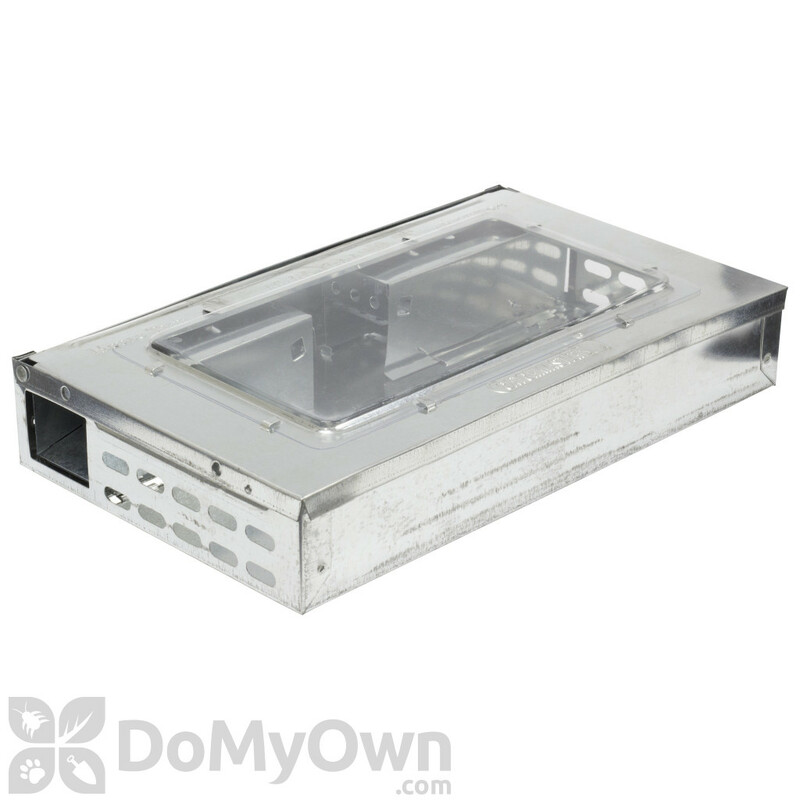 A clear lid on top of the trap allows easy viewing of your catch. Catchmaster Multi-Catch Mouse traps are perfect for the home or for larger areas such as farms, chicken houses, warehouses, etc. These traps are also excellent for sensitive areas where rodenticides or snap traps are undesirable or prohibited. Mice like to travel along walls and not across large open areas. Place the Catchmaster Multi-Catch Mouse trap along a baseboard or in a corner. When the area to be controlled is large, the infestation is severe, or to increase the effectiveness of the traps, place several traps along the walls about 10-15 feet apart. 1. Place the Catchmaster Multi-Catch Mouse trap lengthwise against wall or object with entrance holes nearest to that surface. One very important thing to remember: it may take the mouse 1-2 weeks to become familiar enough with the trap, before it attempts to enter. At first the mouse may just go around the traps or run on top. However, once the mouse knows the trap isn't going anywhere, it will be confident enough to go through the trap. Mice are very cautious about new things in their environment. Worked in just two days! I set up the Catchmaster 612 Mutli-Catch Mouse Trap (with a spoonful of peanut butter) along the wall where I had seen mice running and in just two days I had both mice in the trap. I was clearly able to see the mice through the window on top of the trap. No blood and no guts! I freed the little devils back into the wild. Well, yes, I caught a mother and baby mouse in one night with cheese, but when I waited another night for the rest of the family to join them they had figured a way out. So this patent does not seem to be all that clever as compared with mice intelligence! Thank you for your feedback! Mice are very cautious about new things in their environment. It is suggested when using a trap for mice, that it is not disturbed for 2 weeks. After a while, they will begin to investigate so it is best to leave it for at least 2 weeks before moving it to another area or before making any conclusions on the product's effectiveness. Also, please check out the product video on this page for tips and instructions on effective use. Got one of these and yes they do work very well. I used mine outside to keep the mice at bay on my patios near my outdoor kitchen during the winter months. In a single weekend I caught 8 mice. The only problem is not with the design of the trap as it does exactly as it advertises, they can't get out once there in. But mice are extremely cannibalistic especially under stressed survival situations. So it was so gross inside the trap that I ended up throwing it way because there was no way I was going to clean that out! Definitely will buy a few more to replace it with. The Catchmaster 612 worked really well - for a month. I caught 30 mice, sometimes 4 in one night, and I was happy to release them out in the woods. Then the mice got smart. They have now somehow figured out how to get in, get the bait (dog kibble and sunflower seeds) and get out. The trap still looks in perfect condition, like the day I bought it but it doesn't do its job anymore. Now it is just a mouse feeding station. And it cost nearly $20 with the tax. I ordered your Catchmaster 612. The reason I needed it was I rescued 3 baby mice that the parents deserted when I tore down the shed and when I was feeding them one jumped (apparently in their flea stage!! ), and darted off under the entertainment center. There he remained and lived for about 2 weeks. My dog alerted me that he had moved under the kitchen queen at which point I grabbed up the catcher, down on my belly on the floor and there he was. Placing the catcher in a strategic position I encouraged him to move forward and BAM he went right into the catcher. I was able to save him and return him to his siblings out in the barn, their new home!!! Thank you. Will the Catchmaster 612 Multi-Catch Mouse Trap work for small rats? I have some small rats around, but they're not big city rats. They are furry. I'm in western Washington. I need something like this that I can catch rats in while protecting my chickens from harm from bait (the chickens will play with and sometimes eat dead mice) or dangerous traps. Will this be too small to catch the odd rat or two? They're very resourceful and smart around here. No, Catchmaster 612 Multi-Catch Mouse Traps will not work for small rats. We recommend that you use the Protecta Sidekick bait station with a Trapper T-Rex snap trap inside. This will protect your chickens from the traps and will prevent you from having to use any type of bait. The T-Rex snap trap is very versatile as it can be used inside of the bait station and it can be zip tied or wired to pipes or beams if you suspect the rats are running around on them. Will the holes on the side of the multi-catch mouse trap allow mice to get back out? I know they can get through very small openings--what keeps them from escaping through the vent/air holes on the right and left side? Once the mice get into the Catchmaster 612 Multi-Catch Mouse Trap holding area they cannot get back out. It is true mice can fit through small holes, but the vents on the side of the trap are much too small for the mice to escape. We have sold these for 8 years and never heard of this being an issue. Can I use Contrac Blox in this trap? I have dogs and do not want the poisoned mouse to be around them. I want something that will keep them where they are at until I can get rid of them. We would not recommend putting Contrac Blox in the Catchmaster 612 Multi-Catch Mouse Trap. Rodent bait can take up to five days to kill the mouse once they consume the bait. These traps are made to use with glue boards for faster kill. Using a glue board will also insure they cannot escape when you open the lid. Will the Catchmaster 612 Multi-Catch Mouse Trap work on Chipmunks? The Catchmaster 612 Multi-Catch Mouse Trap will most likely not work for chipmunks. Chipmunks are a bit bigger than mice and may not fit into the trap. Most folks choose to use mouse or rat snap traps for chipmunk control. 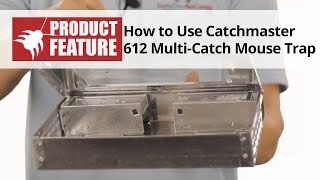 Can you put bait in the Catchmaster 612 Multi-Catch Mouse Trap? 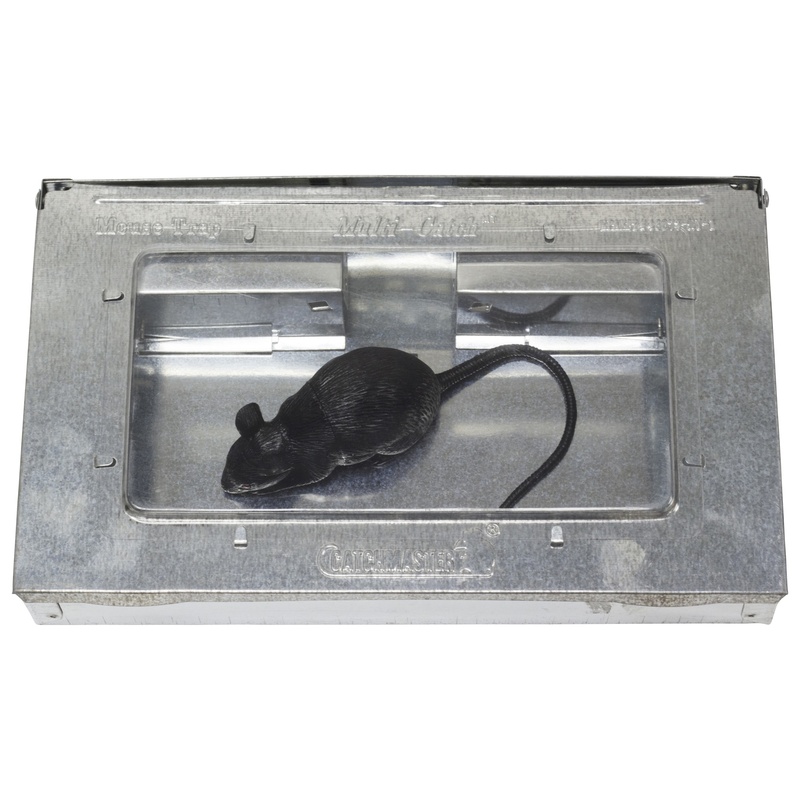 We would not recommend putting rodenticide bait in the Catchmaster 612 Multi-Catch Mouse Trap. Rodent bait can take up to five days to kill the mouse once they consume the bait. These traps are made to use with glue boards for faster kill. Using a glue board will also insure they cannot escape when you open the lid.